Steak is what’s for dinner. This is one of my favorite methods of cooking steak lately. Bake low and slow, let it rest and then sear on both sides. If you know how to use an oven, heat up a skillet or a grill… you can make this amazing steak dinner with sides of your choice. I’ve been making steak like this for a while and decided it’s time to share my tips and tricks on making the juiciest and easy foolproof steak. I like to buy Rib eye steak for this, with or without the bone works. Make this for your next dinner party for your guests or for your family to enjoy. Learn how to make the perfect rib eye steak cooked in the oven with compound butter and roasted tomatoes. Preheat oven to 275°F. Season the steak with salt, smashed peeled garlic and a few sprigs of thyme per side. Lay the steak on a cooling rack that is on a cookie sheet. Bake in the oven in the middle rack for 45 minutes. Take the steak out and let it rest for 15 minutes. Heat a cast iron skillet or grill to high heat to get a nice sear on each side. Sear the steak for 3-7 minutes on each side, depending on how well you like your steak. I like to do it for 3 minutes on each side to render the fat a bit and get a nice sear. Add in the compound butter slices (recipe can be found here) and let it sit for a minute covered to let the butter melt. When you are ready to serve, slice the steak at a diagonal on a cutting board into desired thickness or leave it uncut. Drizzle with my fresh chimichurri sauce and add in the roasted tomatoes. Add tomatoes to a baking dish or cast iron skillet. Drizzle with olive oil and season with sea salt. Bake for 25-35 minutes or until all tomatoes have burst out of their skins. Let cool for about 5 minutes before eating. When you get the steak home, remove it from the package and place it in your refrigerator, uncovered, on a plate lined with a few paper towels until you are ready to prepare it. This will help remove any excess moisture and will also help intensify the flavor of your steak. The sear on this came out great. Once you have assembled your plate of sides you are ready to cut this bad boy and enjoy. let me know what you thought and how yours came out. My favorite salad to serve with this is a GRILLED CAESAR SALAD with homemade croutons and dressing. It’s super easy to make and the smoky grilling part makes the salad that much better. I hope you enjoy and give this a try. This quick and easy salad with homemade caesar dressing and croutons pairs perfectly with the slow roasted ribeye recipe from above. Spray olive oil lightly on the cut pieces of lettuce. 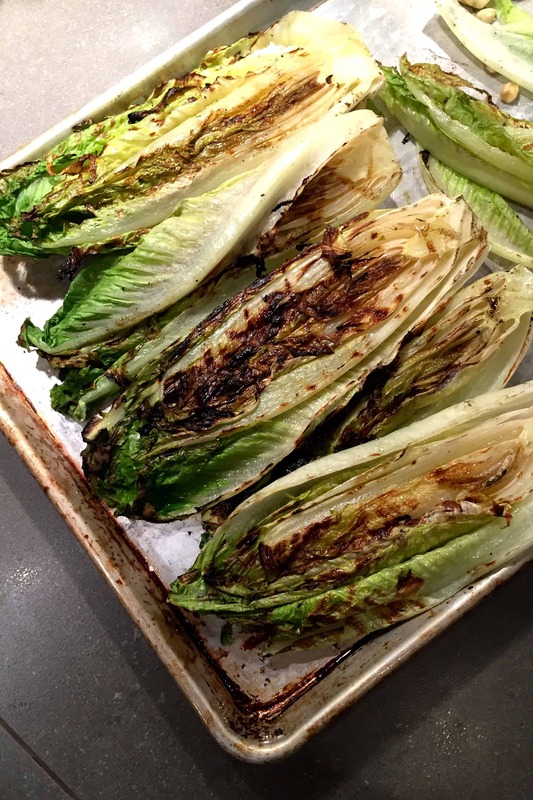 Grill the cut part of the lettuce until nice grill marks form. Flip halfway to create cross lines. Let the lettuce rest and cool down before applying the dressing. Put an immersion blender down into the jar, and turn on. Blend, pulling up as you go, until the dressing has emulsified. This will only take a few seconds. Give it a stir, and then taste to adjust the seasoning. Tasting is key to getting it just perfect. You may want a little more anchovy, or lemon. Keep refrigerated and eat within a few weeks. You will never want to buy store bought Caesar dressing after trying this one, I promise. While you have your grill on, slice baguette into finger width slices and spray or toss in some olive oil. When the grill is hot enough, grill each side creating a criss cross design. Let them cool down and cut them into either squares or in half. Then you are ready to add them on top of the salad and drizzle the dressing on top and shave some fresh Parmigiano Reggiano cheese to add more goodness. Your photos are mouth-watering and I like your twist on the caesar salad. I will have to try the salad very soon and maybe with a T-Bone, too! Making this for a very special birthday this week. Can’t wait to try it! Those steaks look incredible and love the idea of grilling the salad! awe, I am so glad to see this review for the streak, thank you Kristinachka… also, when a man compliments on meat making… that’s a ig deal for me. It’s my favorite way of making steak as well. So glad to see you make it often. My family loves this recipe. To be honest I didn’t make the salad, I just made the steaks. My husband, who loves to grill wasn’t sure what I was doing when he saw me put it in the oven. I told him to trust me, I was using “Lena’s recipe”! I’ve made it a few times now and the first time I used regular thyme because I didn’t have any fresh thyme on hand. It was still delicious. Now my husband will request “Lena’s way please”!!! Thank you Lena for the beautiful work you do. Awe, this makes me so happy… I mean especially when hubbys approve the steak. I don’t let Shey cook the steak either, because I know this turns out better each time for sure. Tell him I am happy that he’s happy. Made the Caesar dressing using the homemade Mayo and it was fabulous. Made the caesar salad and my family DEVOURED it last night, eating every last bite! The flavor of the dressing using the homemade mayo is spot on and I love knowing exactly what’s in the dressing when I feed it to my family. Delicious and will definitely be making this again. Thank you, Lena!!! 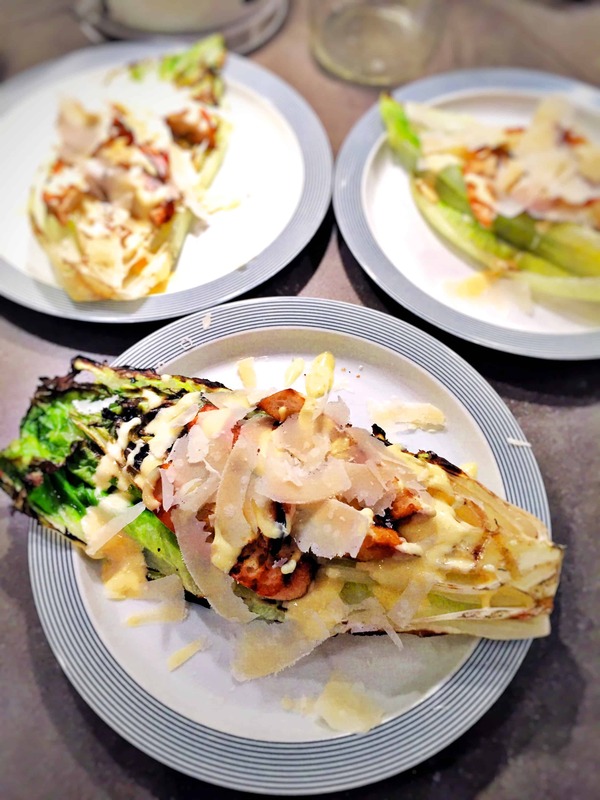 LOVED this ceasar recipe!! The dressing is fabulous and super easy. I love knowing all the ingredients I am feeding to my family. They gobbled down the entire bowl of salad asking for more! I will definitely be making this all summer with grilled salmon and chicken! Thank you, Lena – delicious! !